The historical Surp Haç (Holy Cross) Church on Akdamar Island in the eastern district of Van was renovated and opened as a museum in 2007 by former Culture Minister Atilla Koç. Since then, debate has centered on whether the church would once again be opened for prayer. Buildings designated as museums are not allowed to host religious services under Turkish law. In an interview with the Hürriyet Daily News & Economic Review in January, Culture Minister Ertuğrul Günay said the ministry was making the final legal arrangements to allow the church to open for prayer once a year. Renovating the Armenian church helped begin the normalization process between Turkey and Armenia, but the church remained a topic of considerable debate especially around speculation surrounding whether a cross would be set atop the church. The decision on the cross is still pending. 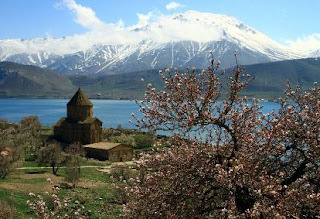 The governor of Turkey’s eastern province of Van, Münir Karaloğlu, announced at the end of last year that the 10th century Armenian church located on Akdamar Island would be opened as a functioning church and museum by next September, inviting every Armenian Turk to the church when it opens for worship. Günay said historic places of worship such as the Sümela Monastery in Trabzon, the Church of St. Paul in Tarsus and the Church of St. Nicholas in Antalya have special significance for Christians and are maintained as museums to be preserved for the generations to come. If there is sufficient demand, Günay said, his ministry would permit religious services to be held at those locations and open them to the public for a limited period of time without hampering tourism. “We will try to do this at each venue,” Günay said while answering questions from reporters at a ceremony in Ankara to celebrate the 46th annual Turkish Library Week. He was asked if the ministry would allow religious services at sites other than the Armenian Cathedral of the Holy Cross on Akdamar Island in Lake Van. On Tuesday, head of the Directorate of Religious Affairs Ali Bardakoglu, in support of the Armenian churches initiative, said that different religions should be allowed to worship according to their beliefs.